The Civil Conservation Corp greatly influenced the development of recreational and ecological areas throughout the United States. Formed in 1933 as part of Franklin D. Roosevelt’s New Deal, the CCC employed young unmarried men, most of whose families were already on government assistance. The program accepted an initial maximum of 300,000 men, paying a small wage of $30 a month and providing them with shelter, clothing, and food. Enrollees benefited from strengthen physical condition, heightened morale and increased employability. Implicitly, the CCC also led to a greater awareness and appreciation of the outdoors for the general public. Over the course of 9 years, volunteers planted more than 3 billion tress, constructed more than 800 parks, built a network of rural roadways, and updated both park amenities and forest fire fighting methods. Roosevelt proposed to create the CCC “to be used in complex work, not interfering with abnormal employment, and confining itself to forestry, the prevention of soil erosion, flood control and similar projects.” Many of Alabama State Parks are a direct result of the work performed by these young men during the depression. Today CCC architecture and structures serve as both prominent and hidden features within our local parks. To speak fully of this array of conservation work would require a dissertation, so let us look at three great parks in Alabama that showcase CCC work at its best. 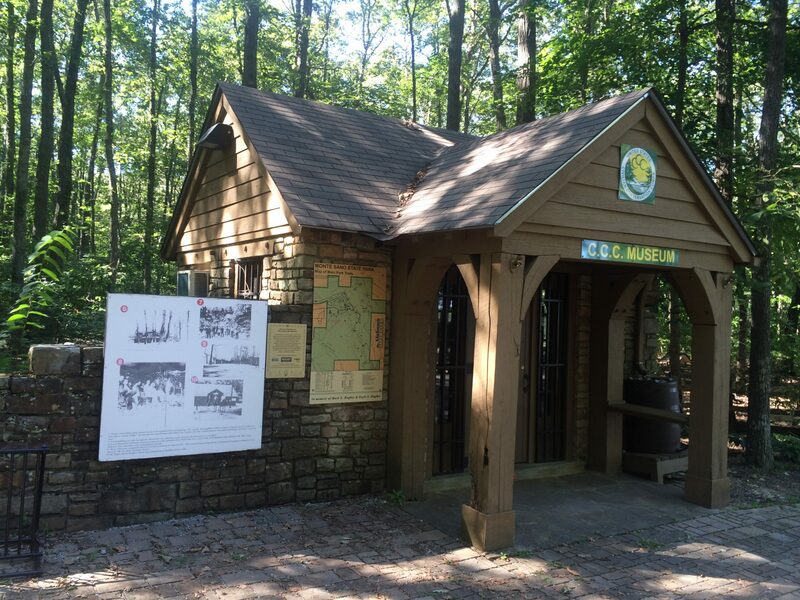 Oak Mountain State Park, located just south of Birmingham, saw improvements made by both the CCC and the Works Progress Administration including foundations, bridges, pavilions, culverts, and roadways. Visitors traveling the major roadways of the park may miss key forgotten improvements which the CCC implemented in the park. Much of the CCC is hidden within the forests of the park, covered over by time and lost to floral growth. In the recent years, though, much effort has been made by the State Parks to expose these works of craftsmanship and even rebuild structures located throughout the parks. At Oak Mountain, the Boy Scouts have undertaken renovation of a large number CCC cabins located at Camp Tranquility. Hikers taking the Foothills trail or Tranquility Road can explore these lonesome cabins nested atop a small overlook along the eastern bank of Lake Tranquility. Those who choose to make this hike can experience the solitude of two of the three camps which existed at Oak Mountain. These camps served to construct roadways on the western side of the park, several lakes and cabins. The third camp, which is left mainly to dirt covered foundations, severed in the building of the Pevine Falls road and features on the eastern side of the park. Besides roadways, the building now used as the Nature Center and Interpretive Center showcase rockwork construction of the CCC. For those in the northeastern region of Alabama, Desoto State Park offers numerous hiking opportunities. CCC features throughout the park include roadways, pavilions, shelters, cabins, a 9-hole golf course (now the primitive campground) and group lodge. Additionally, Desoto how offers one of the first and most complete CCC museums in Alabama. The museum located at the back entrance to the park features pictures, publications, and artifacts form Company 472 and Company 2436. Much effort has been given taken to document the lives of the men who worked at Desoto. Visitors interested in this era are encouraged to peruse the collection of oral and written history. The entrance adjacent to the museum is a great example of the brilliant rockwork performed by CCC labors. Across the road, hikers can take a short one mile hike to the CCC Quarry; the source for much of the rock used within the park. For a longer hike, the CCC Road and trail located in just behind the chalets, offer hikers a view of numerous rock culverts and the unfinished bridge. The end of the CCC program in 1942 and closing of the camps left many programs incomplete. The unfinished bridge is such an example as noted by the incomplete center pier and nonexistent road across the creek. This hike is great for the whole family as it transverses over relatively flat terrain. Others trails through Desoto take hikers past shelters in less explored areas of the park. While in the area, take a short drive to Little River Canyon and enjoy the breathtaking falls and scenic overlooks along the parkway. A little over three miles in length, the parkway will take you by numerous pull offs with rock fences and observations area constructed by the CCC. Bird watchers will find the national park most exciting during spring. Again, there are several hiking opportunities available. 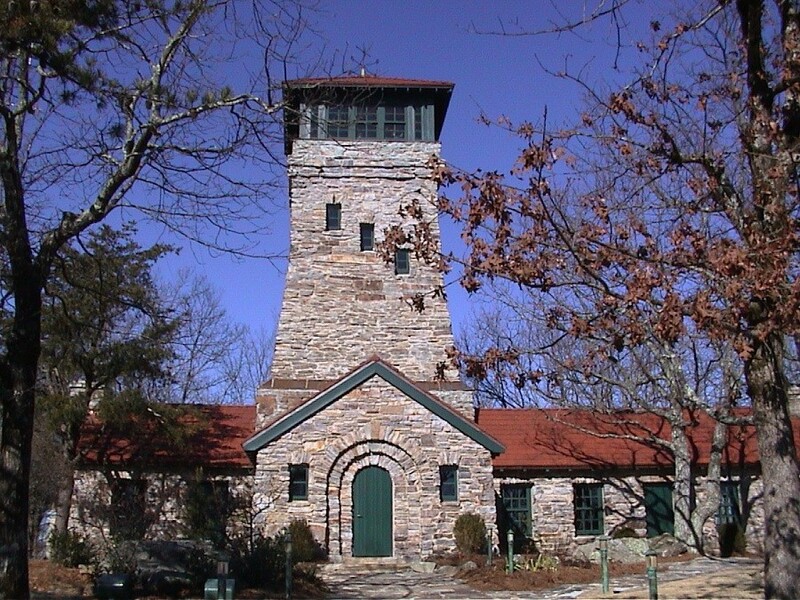 If you find yourself in Anniston, Alabama, take the short drive to Cheaha for a look off Alabama’s highest point inside Alabama oldest State Park. At an elevation of 2,413 feet; visitors can take a short hike along the wooden walkway to Bald Rock to see a majestic sunset over the countryside below. The Bald Rock Group Lodge, located adjacent to the walkway was one of the many CCC projects within the park. Visitors can view intricate detailed rockwork which adores the structure. For those wanting to reach the sky, take a climb up the stair inside Bunker Tower, a stone CCC building with observation deck at the top. As noted before, not all CCC projects came to competition. Southeast of the Cheaha tower stands an identical structure located in Weogufka State Forest. The area is not easily accessible due to land leases and bad roads. Ideally, this would have been another state park in Alabama. Atop the ridge alongside the tower and several CCC camp buildings and a small variety of additional rockwork. While at Cheaha, take advantage of the hiking, camping and backpacking opportunities. Running through the park is Alabama longest hiking trail, the Pinhoti. Running 335 miles (171 in Alabama), the Pinhoti is a favorite spot for backpackers in the southeastern region. If you’re looking for a short day hike on a hot day, the Chinnabee Silent Trail offers a view of several picturesque waterfalls and several places to sit down and cool off. Located just outside the park inside the Talladega National Forest, the trail spans 3 ½ miles one way and has moderate changes in terrain. Cheaha Falls, located one mile from the Turnipseed parking lot, is one of the largest in the park. Overnight camping is available in the primitive campground, located on the site of one of the CCC Camps (another is now Camp Mac, a private camp located along Cheaha Road). Though no buildings exist, the foundations and limited rockwork adore the area. Across Cheaha Road, you can cool off in Lake Cheaha and dry off in the rock bathhouse, both constructed by the CCC. Before leaving Cheaha, hikers can explore two additional destinations which CCC influences. A roadway was constructed to reach the peak of Cheaha. Though closed for 18+ years, this roadway, known locally as the CC Road, contains stone arches and bridges constructed during the Depression. The lower section remains open; however, a 6 mile section is accessible only to the hiker. This portion contains a large native stone bridge crossing Hillabee Creek. Secondly, the Skyway Motorway constructed in the same timeline showcases CCC picnic areas, culverts, bridges, railings and more. Some portions of the road are drivable, though most has been lost in time and accessible only on ATVs or hiking. The Skyway Motorway was to be the Blue Ridge Parkway of the south and attract visitors nationwide. Today, it stands in ruins as a monument to the men who labored in its construction. The CCC was part of a desperate act to help restore and rebuild the economy of the US during the greatest depression to date. An unprecedented approach at the time, Franklin Roosevelt, strived to enact legislation to increase employment and lessen the results of the depression. The men who severed in the CCC did much more than build America’s forests and parks; they provided us a greater awareness and appreciation of the outdoors and our Nation’s natural resources by opening up land that was once inaccessible and unused. Today, visitors, hikers, campers, and backpackers can transverse the State Parks of Alabama as see signs of a time when life was hard but perseverance and hard work paid off. Everyone is encouraged to take time out and visit these landmarks; as they are as close as your local State Park.